The humble disc record is not often properly recognized for the impact its development had on the modern world. On the face of it, these records are just consumer products that allow music to be sold to the masses, a concept that itself only reached the mass market about 100 years ago. The truth is the impact of this technology goes way beyond the consumption of pop music. In some way, the record’s closest comparison is the printing press. The printing press is often considered one of the most important inventions in history due to its ability to quickly and accurately reproduce ideas in the written word, Which in turn, greatly accelerated the transfer and exchange of knowledge. The ability to press audio into the record gave us the ability to reproduce it in scale. It functioned as a vector for cultural exchange and the revolution in recording technology ushered in by electronic and audio engineers that developed the technology is the foundation upon which modern communication systems stand upon. Of course, these days most of the music we consume is digital. The internet has changed not only the way we consume music, but also the amount of music we listen to and the music itself. Curiously while this is happening, Vinyl is seeing a year on year increase in sales. Even more curious is the fact that half of the people who buy an album on vinyl stream it first. 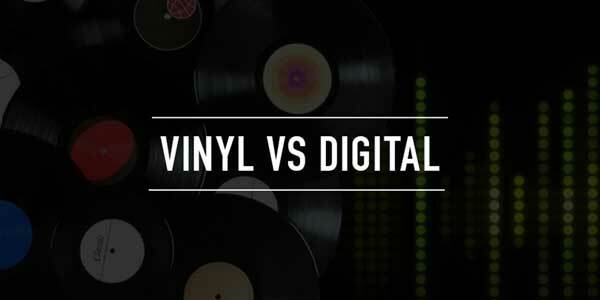 It remains a point of contention whether analogue formats, such as vinyl, are actually superior to their modern day digital counterparts. Is vinyl’s resurgence just consumers seeing yesteryear’s technology through rose-tinted glasses, a yearning for a physical connection to their music or does the music really sound better on vinyl? To understand the differences between these two we need to first understand the commonalities. No matter which format is used, analogue or digital, both require audio data to be created by a recording device. The simplest of these would be the microphone which turns air pressure (sound) into either a digital or analogue signal, which can then be replayed as an electrical analogue signal. This process was first put into use in 1877 by Thomas Edison. While working on the telephone, Edison decided that it may also be worth investigating if sound could be recorded for later reproduction. Edison designed a rotatable cylinder disc wrapped in thin Aluminum Foil which was turned by a hand crank. Attached to the disc was a needle, which in turn was attached to a mouthpiece which adjusted the pressure of needle on the disc. Edison talked into mouthpiece while turning the hand crank at a constant rate and as predicted, the pressure of the soundwaves imprinted a proportional indentation which was analogous to the sound his voice created. When he finished recording, he returned the needle to the start. The indentations which were caused by his voice could now be played back by rotating the cylinder. This invention, the phonograph, was the first example of playable recorded sound and for all intents and purposes, the vinyl record is essentially an iteration of this technology. The first vinyl recorded was pressed in 1948 by Columbia. Vinyl records work on the same basic principle as Edison’s phonograph. A 3d representation of a soundwave is physically pressed on to a vinyl record. An impression is first created by a cutting head. The cutting head creates an impression that is a direct analog of the soundwave. This process creates a master that will go to create a stamper that moulds each record. When a record is played the frequency of the wave that you will hear will depend on how stretched out the wave is on the media and the volume will depend on the size or amplitude of the wave. This audio information will be pressed on to vinyl in one of 3 fashions: via horizontal modulation Vertical modulation OR via a compromise modulation of 45 degrees. Horizontal modulation is always preferable over vertical modulation. This is because vertical modulation leads to more distortion and allows for less amplitude due to an inability for the stylus to track the groove and also a propensity for the needle to bound off the wave if the amplitude is too high. But if we run with only horizontal modulation we can only play audio in mono and we don’t have stereo separation of sound. Accordingly, we use a compromise modulation of 45 degrees in order to allow for the separation of audio from mono to stereo. As the stylus follows the groove, it moves a magnet wrapped in a small coil of copper wire, this causes an electric current that corresponds to the groove on the vinyl, which in turn, corresponds to the physical sound waves that were originally recorded. The electric current can now cause a physical movement of the speakers which will reproduce that sound pretty faithfully. Some vinyl enthusiasts argue that this smooth continuous reproduction of sound from analog to analog is more faithful than digital music. Part of this argument stems from the difference in how digital music is reproduced - high-quality digital audio data is typically sampled 44,100 times per second and this data is recorded in binary format. Close inspection of the wave function produced from binary code shows that rather than the audio data being smooth and constant like real life, the audio data is jagged and technically non-continuous. Because there is an infinite amount of data between each second of audio, we have to sample the audio in regular intervals to minimise the size of our digital file. Comparing this to the smooth continuous waveform that is imprinted in vinyl you would think this might cause some loss in information. Whether there is a loss of information or not depends on whether the 44,000 sample rate is high enough to be functionally the same. An answer to this was proposed in 1928 in a pivotal paper published by Swedish American electronic engineer Harry Nyquist and was subsequently proven by Claude Shannon in 1949. They simply found that to recreate a frequency we only need to sample each individual wave at least twice. If not, the frequency will be digitized with a lower frequency. The maximum perceivable frequency a human ear can detect is 20,000 Hz, and so digital recordings with a sampling rate of 44,000 Hz can capture even the highest frequency possible, thus the sound produced by a speaker using digital audio is effectively the same sound as analog recordings. In this case, the argument that analog recordings are more “faithful” does not meet the scrutiny of science and in theory, digital and analog music recordings should sound functionally the same if played on the same equipment. The argument does not end here though, there are some constraints to how sound can be recorded on vinyl. Interestingly, these constraints largely explain both vinyl enthusiasts preference for the media and also why some might argue that digital recordings are a superior format for storing audio. The major constraint that impacts vinyl is simply its limit in data storage. This is simple to understand - A 12-inch record can only hold so much information in the format we have described. Each rotation of the record takes 1.8 seconds. The next question is how many times each 12 inches can record rotate. Two things affect this, the frequencies found in bass notes require the groove of the record to swing out wider, just as the speaker also thumbs out wider when it plays base. Waves of higher amplitude that produce louder sound also require wider grooves. This means that both low-frequency sounds and loud sounds both eat up valuable vinyl real estate. This, in turn, means that if your record has bass or is loud, like most contemporary music, there is not going to be a whole lot of space on the record for your songs. The net impact of this is that there is a volume and time constraint on a vinyl record. That does not apply to digital music, which has huge ramifications for how we listen to music, and how music is created and mastered. Vinyl’s limitations do not end here. If the frequency is low and the amplitude too high (loud), the stylus can become prone to bounding off of the wave due to the path the stylus has to take up the wave at speed. This can cause the record to bounce around and skip if not accounted for. Accordingly, bass needs to be centre panned in the mix and a specific mix has to applied to music recorded to vinyl to stop this from happening.High frequency sounds also need to be taking into consideration while cutting a vinyl record. The issue is commonly referred to as the “Sibilance Issue”. Sibilance is that unpleasant hissing sound associated with s sounds and other high frequencies. High-frequency waves cause two fundamental problems in vinyl. High-frequency sounds mean the waves are very tight together, the stylus has to surf these waves and turn extremely tight corners. When the curvature of the groove becomes tighter than the tip radius of the stylus, the stylus will begin to plow through the groove and you will end up with distortion. On top of this, extremely high-frequency waves can lead to the cutting head that cuts the record to overheat. This is simply a matter of the cutting head having to take a longer path and having to do more work to cut these waves. The overheating can lead to inaccuracy in the cutting process and in turn to noise and distortion on the final record. To counteract the negative effects that extreme low end and high-end frequencies have on vinyl, a group of American engineers developed what became to be known as the Recording Industry Association of America (RIAA) curve in the 40s and 50s. The RIAA is an equalization scheme that is applied to the sound before the master lacquer is cut. In essence, this curve reduces bass content and boosts treble in the record. Without this curve, low frequencies take up so much space that each 12 inch LP would only allow for 5 minutes of music. In addition, boosting the treble hugely lowers the surface noise that vinyl can produce due to the path the stylus takes. This is also why a turntable requires a special phono preamp – in addition to amplifying the tiny voltage created by the turntable’s cartridge, the preamp applies the inverse of the RIAA curve, perfectly restoring the music’s natural balance and minimizing the size constraints that are intrinsically linked to the nature of the media. So we have painted a complicated and grim picture for vinyl as a storage media. The actual truth here is that there is no functional difference in audio quality between digital and analog formats and studies show that the human ear and brain are not sufficiently equipped to distinguish the difference between sound produced from analog signals when compared to a digital counterpart. At the very least, this is enough to debunk the notion that digital music formats are a lesser quality format than analog formats. An important question to ask here is why are people, that understand these concepts, still drawn to vinyl? There is a number of simple answers to this question: Part of it is the nostalgia factor - people have positive personal associations with the vinyl format from their youth and these associations invoke an emotional state that induces a sense of comfort and although there are no discernible differences in theoretical audio quality, vinyl does have a specific sound that is imparted due to the mastering process. Mastering is the process by which the final song is mixed for the final device it will be stored on. Over the past 36 years, due to the removal of the physical limitations of vinyl media and the spread of digitized music, songs have become increasingly louder and increasingly more compressed. In essence, this means that the sound wave becomes compressed, forcing the quieter parts of a song to become relatively louder and the louder parts relatively quieter, the net effect being a louder, noisier song. As a result of this trend, a vast majority of commercial music releases have been subject to a somewhat arbitrary loudness war that has forced them to increase loudness to keep pace. It has also resulted in increased use of compression of the music which some would argue has resulted in a loss of detail and nuance in the final sound. This development has been criticized by a number of prominent audio engineers and is part of the attraction towards vinyl. Some people prefer vinyl for this reason, music properly mastered for the medium is a certain degree immune to the effects of the music loudness wars and in some cases, this can mean that the more nuanced parts of the song are easier to pick out for a trained ear. Really though, given that this same information can be recorded on a digital format and replayed exactly the same, the answer to this question is that digital and analog formats are functionally the same in the quality of sound produced and any preference for one media or the other, is really just that, a preference. The longevity and iconic status of the vinyl record as a music format cannot be ignored though. Despite the shortcomings we’ve described, it is incredibly durable and elegantly simple medium. This is probably best exemplified in the gold-plated record sent on the Voyager 1 In September of 1977. It’s hard to believe but 12 billion miles away from here this record is floating through space. Its cover contains simple instructions for playback based on certain universal constants and the record itself contains a high-resolution snapshot of 200,000 years of human culture. Unless the Voyager 1 suffers a direct impact or encounter heat that may melt the record, this record, in theory, should out survive even our species.